Ever Since the launch in early 2015 of the Raspberry Pi 2 and followed one year later in early 2016 with the Pi 3, the Raspberry PI development board is now with out question a fully usable desktop computer, provided you just need it to perform any of the standard office and internet tasks performed in most peoples day to day requirements. So both of these models ( 2b & 3b ) perform very well for the operations of which any one buying a credit card sized computer could think of and expect to get. The Raspberry Pi project however has always been aimed at educational needs in computer science, allowing for the needs of schools and higher education facilities. At its low price of €40 you can fill up the desks of students and allow them to experiment to their harts content, even if they damage them they are very simple to replace. It is not only in the area of cost that the Raspberry Pi wins however, the fact is that this little computer is much more flexible than any desktop or laptop pc when it comes to the area of learning to intelligently program electronics based hardware devices. Just like many of the available development board computers available today the Raspberry Pi systems allow you to not only communicate with recognised PC peripherals such as (Disks, printers, scanners, modems and screens) they also provide you with the ability to communicate at the lowest possible level with any electronic device that can be manually configured to connect to the Pi via the provided 40 pin GPIO connector on the Raspberry Pi Board. You can see this 40pin connector at the top of the PI board in the first of these two images. This is a Raspberry PI B+, the original Pi board in the current B series (B+, 2B and new 3B) Pi’s. 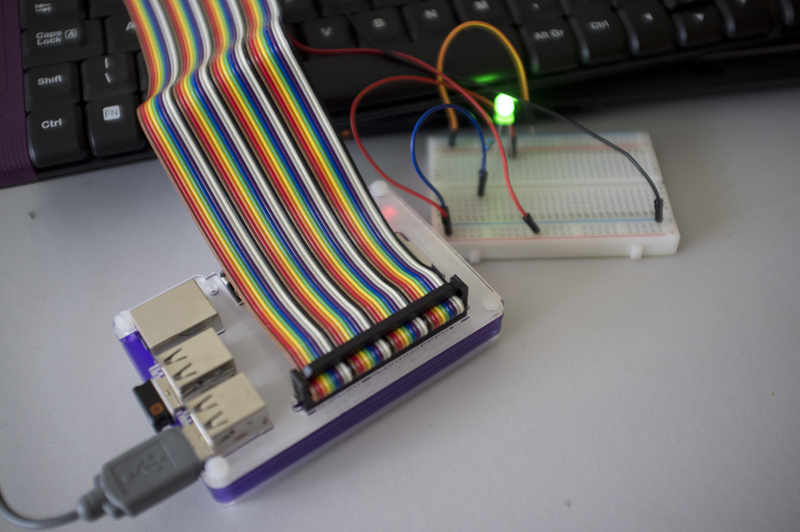 The GPIO enabled pins are designated a GPIO number as you can see in the second image here. I will in a later post come back to define the functions of all of these pins, if you enlarge and view this images however you will see that not all of the 40 available pins are in fact given a GPIO number, some being used to provide a positive current of (3.3v or 5v) and then other pins used as a Ground in order to complete a circuit. 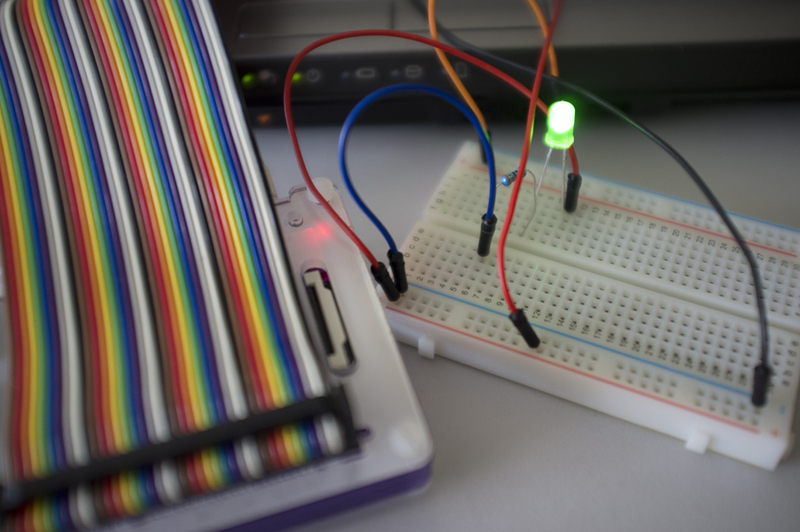 The live (3.3v or 5V) pins and the Ground pins are used in one of the very simplest of electronic projects for the Raspberry Pi, the lighting of an LED. This is exactly what your pc or TV does when you first turn it on and can be used in the same way to show that your Raspberry PI is powered on. In my following post I want to examine how these GPIO pins and thus any attached device can be programmed using computer code. It is possible to install any of the programming languages available in the Linux repository including (Basic, Ruby, Fortran, Lisp, Cobol, Python, Pascal and C++ …) however not all of these Languages have the facilities with in themselves to control GPIO pins , so I want to look at which ones have and how they can program GPIO input and output !! This entry was posted in Development board hardware, Development boards, Development Languages, Linux, Raspberry pi, Single board computers and tagged c++, Coding skills, Computers training, Electronics, GPIO, IT skills, Nigel Borrington, Pascal, Python, Raspberry pi, Raspberry PI GPIO pins. Bookmark the permalink.